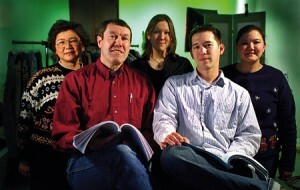 The Brough Family (from left, Elisa, Greg, Brittany, Brian, and Jennifer) make family-friendly films. The Brough family finds it difficult to avoid talking about work. “We have to put a limit on how much we talk about it because it’s our passion,” says Brittany Brough Wiscombe (BA ’02). In 2000 the Broughs founded Candlelight Media Group, a company that specializes in production, distribution, and representation of family-friendly films. The company also distributes films and videos to specialty markets and represents film producers and their projects. Inspiration for the company came when parents Gregory K. Brough (BS ’72) and Elisa Jan Brough (’74) of Orem, Utah, saw how much their children loved film and recognized it as an opportunity to influence their children’s lives. “This was a way for our parents to guide us and invest in our futures,” says Wiscombe. Gregory and Elisa operate as CEO and president, respectively. Their son, Brian A. Brough (BA ’99),who has been involved in such films as Saints and Soldiers and Brigham City, is vice president, producer, and director. Jennifer Jan Brough (BA ’96) is director of support services and focuses on marketing strategies for promoting the company’s new DVD titles. Wiscombe is writer, screenwriter, and coproducer for the company. An example of the family’s work is Everything You Want, a film that premiered on Disney’s ABC Family Channel in 2005. It was inspired by the stage playSy’s Girl, by Natalie M. Prado (BA ’02). Candlelight Media Group brought the play to Hollywood with help of director T. Ryan Little (BA ’00). The Broughs are pleased with the possibilities Candlelight Media Group offers them. “The company is a way for us to produce the type of media and content we want to be associated with,” says Wiscombe.